This is a very easy five-strand braid which I have used as a zipper pull as well as on the end of a narrow band. The warp ends at the end of a narrow band can be separated into five groups to make one wide flat braid. Above right, warp ends have been gathered into five groups without separating the colors, braided and then wrapped to finish. 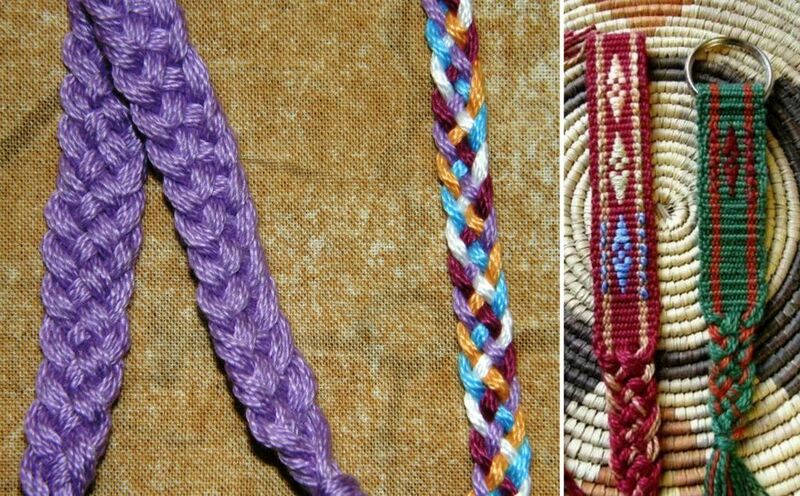 Above left, a five-strand braid has been made with a single color and another with five different colors. Different numbers of colors arranged in different ways will produce different effects. I haven’t experimented with this yet. For this tutorial I used five colors to make the instructions clear. Separate the five strands into two groups. You can see above left that I have three strands in one group on the left and the other two in a separate group on the right. The three strands on the left will be worked just like a three-strand hair braid. The outer strand, in this case the orange one. crosses over the middle strand, in this case the blue one. The white strand crosses over the orange one. Now the grouping has changed. We still have two groups but now the orange has joined the group on the right to make a group of three with the purple and red and the other group of two is on the left. The group of three on the right is now worked like a three-strand hair braid. The outer strand, in this case the red, crosses over the middle strand, in this case the purple. Then the orange strand crosses over the red. Once again the grouping has changed. The red has passed to the left to form a group of three with the white and blue. The other two strands form a group of two on the right. We are back at the beginning. Braids like these can make nice zip pulls. Here is one with five strands but only four colors. This is the best tutorial I’ve seen. Made the process very easy to follow. Thank you. This is great, it took me two passes to have it down. Braided some nice straps to hang my kayaks up, Stylin’ and functional. If I am braiding the warp ends of my woven band, the ends are attached to the band at the start. When I finish, I pull all the threads together and wrap them tightly in a piece of yarn. Then I trim the ends of the threads so they are all even. If I am making a zipper pull, I thread the five ends through the hole in zipper tab so that my five threads are folded in half with the zipper tab in the middle. That means I have five doubled ends to work with and I braid using two strands of each color as one. I would really love to make that three stripe pattern as a bracelet. Is there a pattern for that floating around anywhere? I’ve been trying to create those stripe patterns myself but am having difficulty with it. Can you be more specific, please? What three-stripe pattern are you talking about? The one with the red, white brown, and yellow. Those patterns are charted in the books I sell. 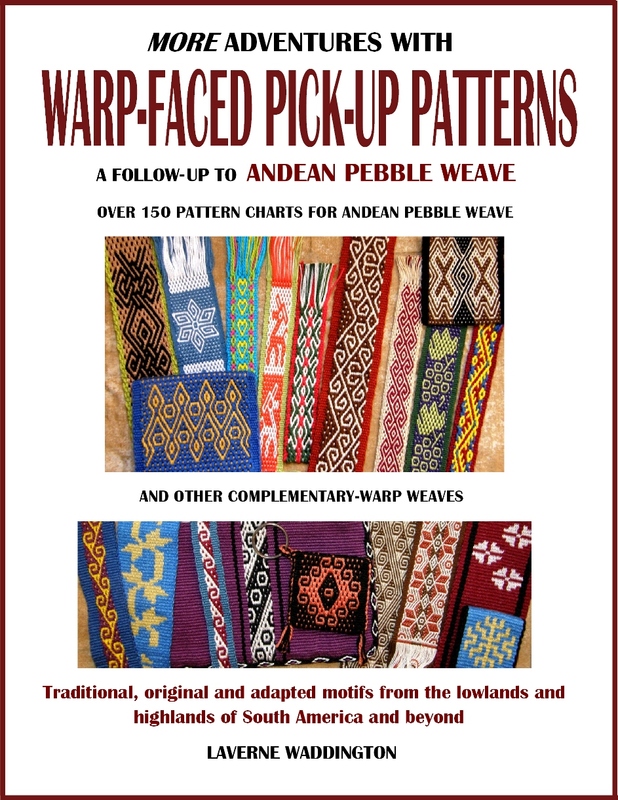 What weaving technique are you using? Nice, I’m using a knotting technique with friendship bracelets. 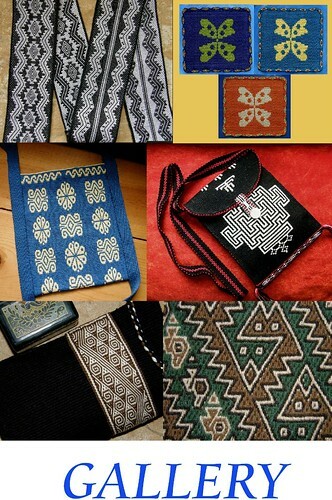 Finding your blog has me more interested in weaving though. I just don’t have equipment for that. What book would that pattern be in? 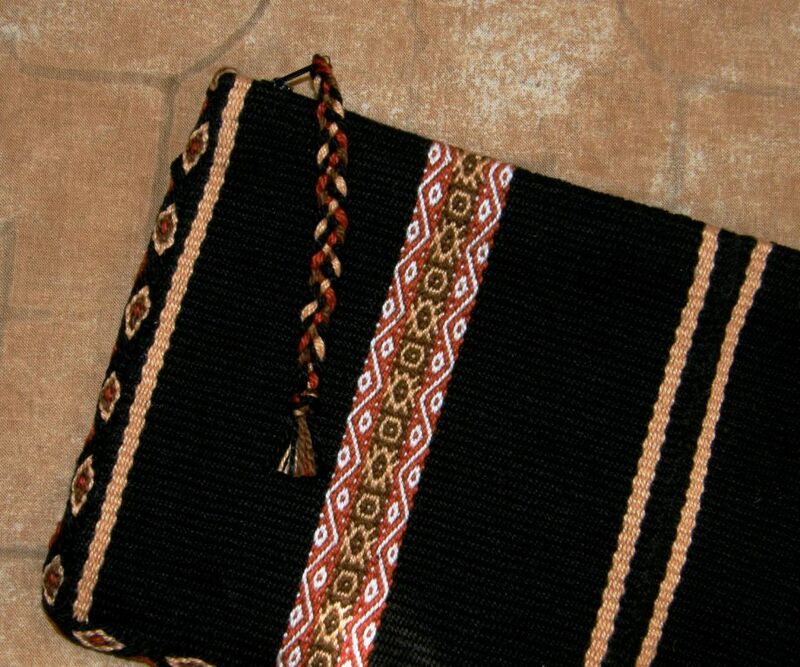 The pattern is woven and you would need to learn how to weave that particular technique first. 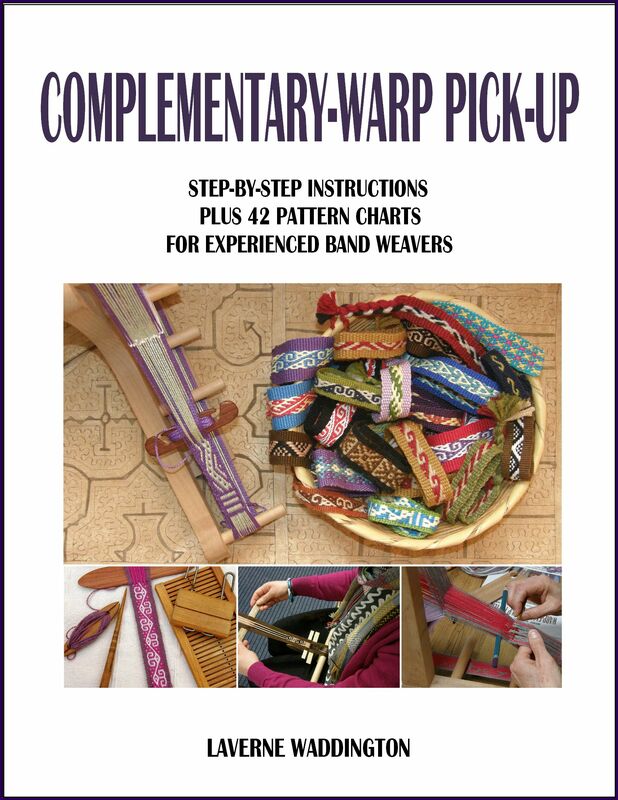 The pattern does not appear in this book but this book teaches how to weave that structure: Complementary-warp Pick-up. 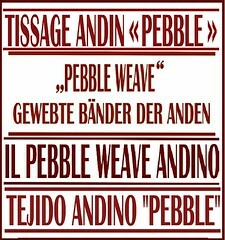 The book assumes that you are already a weaver and can weave bands so it is not for someone who has never woven anything before. 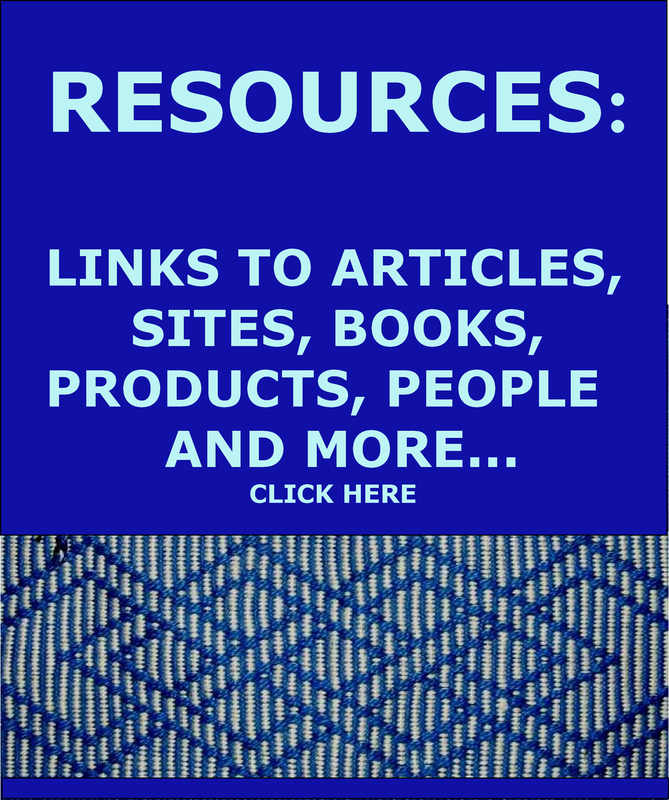 I have lots of free information on this blog on how to get started in this kind of weaving. Take a look around. Good luck. Clear, concise instructions. I make hat bands and had never done a 5 strand. Thank you. You’re very welcome. I hope you use it for one of your hat bands.